In the annals of anti-transit nonsense, there’s a particularly ill-considered line that goes like this: No public investment should go toward this streetcar/light rail line, because it’s going to pay off for private developers. This logic was used by the Fort Worth City Council late last year when, in their infinite wisdom, legislators put a stop to a study examining the benefits of a streetcar. To call a transit project a “handout for developers” and a roadway “necessary public infrastructure” is an enormous double-standard. The reality is that every transportation project is also an economic development project – every transportation project has impacts for development. This gets to one of the hearts of the sprawl vs. urbanism debate – the reality that sprawl is not the result of the free market simply choosing a totally car-dependent lifestyle. The invisible hand of government has led the way since WWII, resulting in the built environment we have, and are paying for (in more ways than one), now. Without hugely subsidized roadways and freeways (the reality being that roads don’t even come close to paying for themselves, as even highway-crazed TxDOT has admitted), there wouldn’t be the sort of car-dependent development we have now. Those same roadways mean that when we do have moderately successful urban places, they’re little pockets surrounded by parking or choked with excessive car trips. 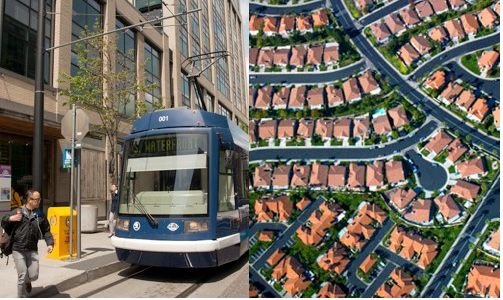 Or, put more simply: You get the development you design your transportation systems for. Well put. Next time you hear someone make a lame-brained argument against transit on pseudo-libertarian grounds, remind them nobody’s asking Wal-Mart to pony up for an interchange. Elsewhere on the Network today: PubliCola highlights Abogo, the mapping tool that illuminates the costs of transportation in suburban verses urban locations around the country. Sharable Cities highlights the “Transition Cities” movement, in which local governments are helping lead the country toward a saner relationship with energy. And Biking in LA uses a tragic story to illustrate how safety improvements for drivers often come at the expense of cyclists. Fine… but transit that runs on unwalkable roads with each station surrounded by a parking lot doesn’t really promote dense development, either. It extends the auto-oriented suburbs downtown, instead of extending a walkable downtown to the suburbs. Most new transit lines are not planned with stops surrounded by parking. TOD has become pretty standard for new station planning from coast to coast. Even if a station is planned to be surrounded by sprawl — which is not something I support — it can be retrofitted in the future easier than sprawl that has no transit. See what has happened in the DC area in the last 10 years. One after another Metro station that was once surrounded by parking has been planned and built as an urban center. That anti developer ‘argument was a if not the main argument heard ad nauseum against NYC’s Westway- with scarcly a mention of the perpetual property tax additions and the environmental benefits of the heavy vehicular traffic being underground?! In Roseville, CA, when there was a big development boom, the city government made the developers pay for the freeway interchanges and adding lanes to the freeway. They charged developer fees for each house too. In this way, the people who bought new houses in the area were also paying for the road infrastructure they would be using. Unfortunately, in the long run everyone pays higher taxes to maintain the roads, freeways, and interchanges. This makes everyone pay for costly infrastructure they may not use. One model for rail-proximate development uses ‘recapture’ as the principle. Rather than frame it as property owners paying for the infrastructure (as suggested above), recapture views the private sector as benefiting from the public investment, with higher real property valuation that flows from it. That investment is recaptured by special taxing districts, for example, that can be highly tailored. In Los Angeles, the regional transportation planning agency (Metro) is also in the land business, with control over large projects adjacent to rail stations. As the post suggests, there has been no greater private subsidy at public expense than the Defense Highways program that brought us the superslab (a battle largely concluded here in LA, but playing out in Texas at Texas-scale). The land business is the world’s second-oldest vocation, and a more pernicious kind of whoring, IMO. The trick with either rail or road investment is to recapture the benefit for the public and not let poicymakers allow it flow to politically-connected special interests. You might also find that Koch Industries makes products used in building roads and highways.